Poker Boy has saved the world a number of times, but never from an alien. 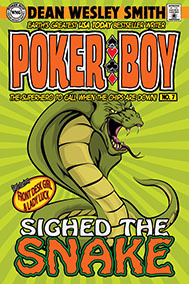 With the help of his sidekick, Front Desk Girl and Leverne, Lady Luck herself, Poker Boy must do battle with an alien snake across the only battlefield Poker Boy knows: a poker table. The stakes are higher than in the original Garden of Eden. To make matters worse, Poker Boy hates snakes.